This 4/4 cello for sale was made in West Germany in 1976 by Erich Grunert. Grunert had a reputation for making very decent cellos in his factory in Penzburg. This particular Grunert Cello is unique from many others because it has a very red varnish and a two-piece back. It is entirely carved, which is a huge step up over the West German laminated cellos of this period. This cello has a nice feel to it; it plays easily with a tone that is deep and warm. The only repair made to this cello is for a very small top crack by the saddle. 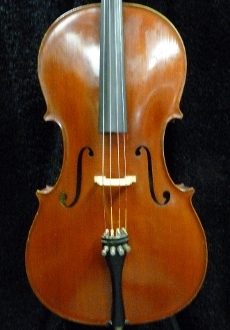 Priced at $5220.00, this Grunert would make a good cello for a serious student.